Bipartisan Bill To End Trade War Accuses Trump Of Levying Tariffs "Under False Pretenses"
The fact that the bottom hasn't fallen out of the US economy (as many free traders warned that it would) has largely vindicated President Trump's decision to push ahead with his trade war over objections from Republicans, Democrats and business groups from Silicon Valley to Detroit, to the farm belt (and beyond). But while Republicans (and even some Democrats) have largely fallen in line behind the president - see Larry Kudlow's embrace of Trump's "fair trade" rhetoric - every once and a while, we're reminded of just how viciously globalists in Washington and beyond fought the president when he announced his plans to unveil his first significant round of global tariffs - on imported aluminum and steel - nearly one year ago. For anybody who had assumed that Trump's battle against the free traders had resulted in a decided victory for the administration, the latest reminder that this is decidedly not the case comes courtesy of a group of bipartisan lawmakers who are pushing a bill to revoke President Trump's authority to levy tariffs under the auspices of "national security." According to Reuters, legislation known as the Bicameral Congressional Trade Authority Act was introduced by two bipartisan groups of lawmakers in both the Senate and the House of Representatives. The text of the bill accuses Trump of levying tariffs under "false pretenses" and, if passed, it would require him to seek Congressional approval in the future. 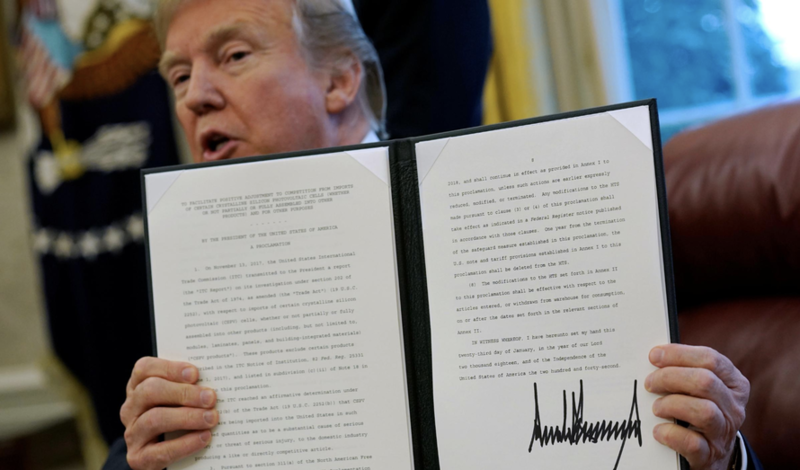 And as it happens, the push to curtail Trump's tariff-levying authority, which comes barely one month before the US is supposed to enact its next round of tariff escalation against China (that is, unless a trade deal is struck), is being led by a Republican: Pennsylvania Senator Patrick Toomey, who led a similar push last year that never made it to a vote. "The imposition of these taxes, under the false pretense of national security (Section 232), is weakening our economy, threatening American jobs, and eroding our credibility with other nations," said Republican Senator Pat Toomey of Pennsylvania, co-sponsor of the Senate bill. And Toomey isn't the only Republican to push back against Trump's trade wars: Senate Finance Committee Chairman Chuck Grassley pressed the Trump administration this week to lift tariffs on steel and aluminum imports from Canada and Mexico before Congress begins considering a bill to implement USMCA (better known as Nafta 2.0). Of course, the bill doesn't have much of a chance of passing. If it did, it could very well throw a wrench in the works of the US-China trade talks. Because what incentive would China have to relent to the US's demands if lawmakers were on the verge of legislating the end of the trade war?